It is with pleasure that I welcome best-selling author Anna DeStefano to the blog. Secret Legacy, Anna’s second novel in her paranormal fantasy Legacy series was just released on May 2, Anna says the stories contain elements of paranormal, SF and contemporary fantasy. Anna’s guest post explains how this eclectic mix comes together. To celebrate Secret Legacy's May release, Dark Legacy, Book 1 in the series, is a FREE eBook from May 2nd-9th on Amazon, Barnes and Noble, Borders and Diesel Books. Grab yourself a copy and enjoy the ride! One winner for a free ebook download of Secret Legacy direct from Dorchester and one winner for a signed copy of Dark Legacy from Anna. Open to US and Canadian residents. Giveaway closes May 14. Please complete the form at the end of the post. As always feel free to leave a comment or question. WELCOME ANNA! Sci-fi/Fantasy... I've had more conversations about the term in the last few years than I did in my entire geeky, Trekkie youth. On KindleBoards, on fantasy forums, through GoodReads networks, in person etc. Everyone has an opinion. Some are purist. Some enjoy variety. But everyone who digs what's now considered speculative fiction is searching for more of what they love, and there so much variety on the market there's little chance of the genre boring you. Coming from a romantic suspense background already makes me an odd duck in many circles, including my growing involvement with International Thriller Writers. Especially there, since my thrillers are more psychic fantasy than mystery/suspense. Well, they're contemporary fantasies with a strong scientific basis for my world building that keeps you on the edge of your seat. Three-fourths of the action in my latest release, Secret Legacy, takes place in dream sequences shared between the protagonist and the scientists and psychic warriors battling for control of her mind. Think of the movie Inception, and you'll get an idea of how the lucid dreaming and shared dreaming science behind these books plays out. Though, let me just say that Dark Legacy was written and published long before the movie hit theaters ;o). Of course, Secret Legacy also focuses on the family dynamics between my psychic twins and the romantic relationship between my protagonist and the "watcher" who's already once before betrayed her to his Brotherhood. My reputation for writing something that doesn't quite fit into any genre box has been sealed. The Legacy series is just different. Romance. But not really. Sci-fi/fantasy, but not space battles and warships. Thriller, but not procedural, even though the life-or-death focus on solving the mystery/crime is there from page one. Fantasy. The escape is so contemporary that I hope you'll leave my Legacy world wondering if things like this could really be happening all around you. 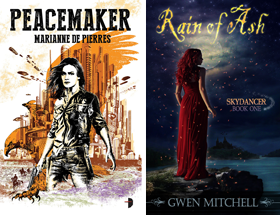 It shouldn't be so surprising that these novels are now racked in sci-fi/fantasy. After all, that's what I craved when I read as a kid and a teenager. My research for current and future Legacy novels involves months of gleefully scouring books on metaphysics and parapsychology (my current favorite is Michio Kaku--I'm tearing through his backlist and his latest, Physics of the Future). I've based the alternate reality in my books, the Psychic Realm, on fringe science that I've always been fascinated with. For as long as I can remember, active (and interactive) dreams and odd kinetic occurrences have been a regular part of my life. And now they're part of my creativity. My career. My story. The odd thing, when I think about it, is why it's taken me so long to embrace the "different" types of realities and characters I want to create, even while I continue to pursue my career in classic romance. What happens next in my fantasy novels remains to be seen. Going forward, I'm trying not to tie myself down to being exactly this or that, the way I have with other work. With these stories, I'm not so determined to fit within a single set of expectations. I'm committed to breaking even more boundaries. All I know for certain, as I dive back into the series to write a three-book continuation for another Legacy family with even more interesting psychic gifts, is that I've never been happier or more creatively inspired! A blurb for Secret Legacy is below, along with an interview I did for the series. An excerpt is up on my website (www.annawrites.com), and I blog weekly about the Dream Theories and Psychic Realm behind my psychic fantasies (www.annawrites.com/blog). Join me. I'd love to hear what you think! Oh! And to celebrate Secret Legacy's May release, Dark Legacy, Book 1 in the series, is a FREE eBook from May 2nd-9th on Amazon, Barnes and Noble, Borders and Diesel Books. Grab yourself a copy and enjoy the ride! “Help me...” cries the child from Sarah Temple’s nightmare. The voice haunts her more every day, whether Sarah's awake or asleep. A month before, Sarah made the same plea. She barely escaped the covert organization experimenting with her psychic ability. Now, exposing their secrets is the only way to save the lost little girl who's become the next target–a special child who can manipulate dreams and alter people’s will. But is Sarah’s mysterious link to the girl a clue, or a tactic of her captors to lure her back? The only way to be sure is to trust the man who broke her heart in order to save her life. A psychic warrior honor bound by a centuries-old brotherhood to protect Sarah and safeguard the...Secret Legacy. Hi Anna: I've read and really enjoyed your writing, and have admired how you play with and transcend what I imagine are some boundaries that romance publishers set for their writers. Can you comment on what it is that drives you beyond those boundaries, and how that's been received by your readers? Thanks! Some of my long-term readers were confused at first, I have to admit. And not just with the Legacy series. I began specializing in suspense a few years back while I was still writing "family" dramas, and most of that audience was thrilled (pun intended ;o) Some didn't like the frantic pacing and the danger elements. But that's what my writing was becoming, and try as I might the more traditional themes weren't inspiring me in the same way. The psychic fantasy direction my mainstream work has taken is the same kind of unintentional evolution. Would I sell more books if it fit more neatly in withing the more mass market appealing "urban fantasy" or "paranormal romance" genres. Absolutely. But forcing my creativity into those molds wasn't working. And pushing that kind of resistence can stall a writer's voice quicker than just about anything else. "Write what you want to write," my agent told me at that point. "Write what makes you excited to be creating." And this is the crazy, spooky stuff that my heart desired! My favorite authors break all the rule...genre mashing at its best. We all like more than one flavor of ice cream (if someone doesn't like ice cream, they might not be human! ), so why wouldn't we as readers like more than one specific genre element in our books? Keep writing outside the box. Readers will love you for it! I look forward to reading Secret Legacy! Congratulations on your new release and thanks for letting us know about the freebie of Dark Legacy (Borders isn't offering it free, at least not today, but Amazon and B&N work).